A motorcyclist was taken to the hospital to be treated for injuries suffered in a collision with another vehicle Monday afternoon in Paso Robles. It happened at about 2:30 p.m. at Spring and 7th streets. According to police, witnesses said the driver of a sedan was turning left from 7th Street onto Spring Street and struck the motorcycle. Police say the driver’s view was partially obstructed because of a truck parked along the road. 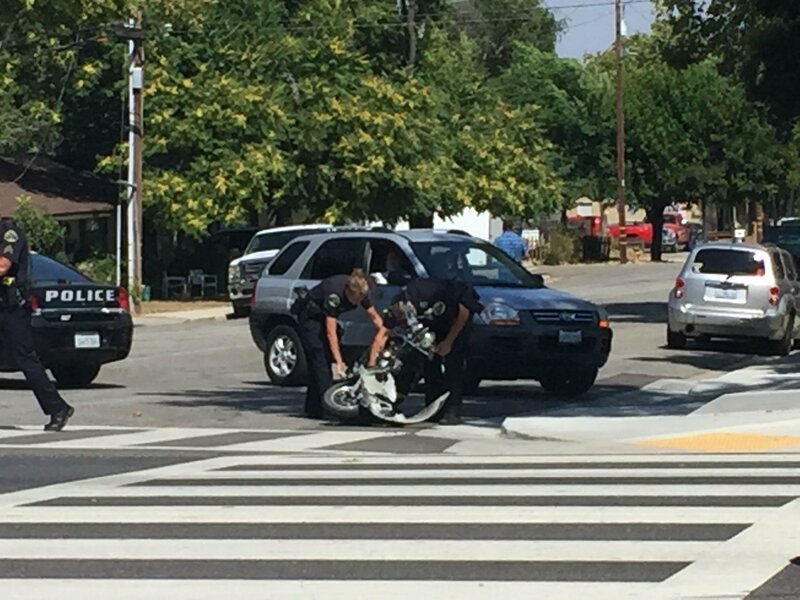 The male motorcycle rider was reportedly ejected from his bike onto the street. The extent of his injuries is unknown. The driver of the sedan was not hurt. The intersection was closed to traffic while officers conducted their investigation. If you have been injured or lost a loved one due to someone’s wrongful conduct or negligence in California, you may have a right to a wrongful death claim against the negligent party. James McKiernan Lawyers encourages anyone who may find him or herself in such a difficult situation to contact an experienced Central Coast Personal Injury Attorney at 1-800-200-HURT (4878) for a free case evaluation. We only get paid if you get paid. Our offices are conveniently located throughout California. At James McKiernan Lawyers, We work tirelessly to deliver accurate news about the California accidents that impact our readers and clients most. Although our goal is to keep people as informed as possible, we’d like to note the information we aggregate is obtained from a wide variety of non-affiliated secondary sources. These include but are not limited to: Law enforcement agencies, press release, News articles, and websites. As we publish and share accident information, we make all possible efforts to ensure its correctness, but for the aforementioned reasons, we cannot guarantee that our content is completely accurate. Although we generally respond to inquiries and requests to change, update or amend the content and articles that we publish, we cannot promise that we’ll be able to do so within a given time frame. The articles and blogs that we share or post here and on social media are designed to serve solely as general information. They should not be taken to constitute legal, medical or any other form of express or implied advice. Similarly, they may not be applicable to your personal circumstances, situation or case. Any information referring to specific laws, statutes or legal actions reflects legal principles, but the laws that apply to you may differ based on your situation, jurisdiction or other factors. Have you been involved in a motorcycle accident and injured because of a careless driver? Maybe someone was texting or distracted when they caused the accident. Perhaps they just weren’t paying attention. This is due to negligence on the part of the other person. As with anything, the newer you are in the activity, the fewer skills you have acquired. The same is true for motorcyclists. They simply have not developed the degree of skill that an experienced rider, and consequently they are more prone to being involved in accidents. If involved in an accident, Paso Robles auto accident lawyers can protect your rights to recover compensation. The Insurance Journal reports that studies show the first year of driving is the most dangerous for motorcyclists, and their greatest propensity for accidents is during their first month on the road. In fact, they are four more times at risk for having an accident during the first month. One study shows that nearly 57,000 motorcyclists filed crash claims, and of those 22 percent of motorcycle accident victims experienced accidents within the first month. Once the first month was behind them, claims dropped by one-third the second month, and by six months close to two-thirds. Supersport bikes are among the most dangerous motorcycles. They can reach close to 200 miles per hour and are very popular with young drivers. According to one consumer report, while the bikes were only 10 percent of registered motorcycles in 2005, they led to 25 percent of motorcyclists’ deaths. Excess speed and driver error were the largest factors in fatal crashes involving supersport bikes. If you are involved in a serious accident, motorcycle accident lawyers in San Luis Obispo can help you deal with insurance companies and parties who are liable for your accident. James McKiernan Lawyers works diligently to overcome biker bias and other obstacles so you receive fair compensation for injuries. Santa Maria motorcycle accident lawyers see all kinds of accidents and work with clients to maximize their compensation as much as possible. Continuing to improve your riding skills and learning how to put safety precautions in place is an ongoing process for motorcyclists who wish to avoid accidents. In the event that you are in an accident, motorcycle accident lawyers in San Luis Obispo can help you deal with insurance companies and other liable parties. James McKiernan Lawyers offers a free initial consultation and charges no fees unless we recover compensation on your behalf.